The Entertainment Bus (E-Bus) is a service provided by Capital Metro in conjunction with PTS and the Austin Police Department. The E-Bus is a late night service that picks up passengers from UT, west campus, and Riverside areas, with drop-offs and pick-ups at 6th & Colorado. The E-Bus provides a safe alternative to driving to and from Austin's entertainment district during weekend evenings (Thursday - Saturday from 8:30 p.m. – 3:00 a.m.). UT students, faculty, and staff may ride the E-Bus at no charge. You must swipe your valid UT ID upon boarding the E-Bus, both to ride downtown and to come back home. Please have your valid UT ID ready when boarding. 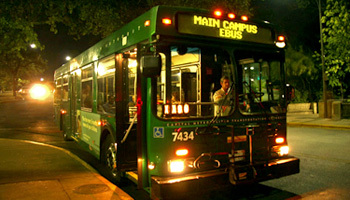 If you are not a UT student, you may ride the E-Bus by paying a $1.25 fare. It is recommended you purchase a round-trip day pass for $2.50 upon boarding. Other Late-Night routes include Night Owls and MetroRapids, which runs until 2:30 a.m. Thursday - Saturday.